to dispose of our garbage. 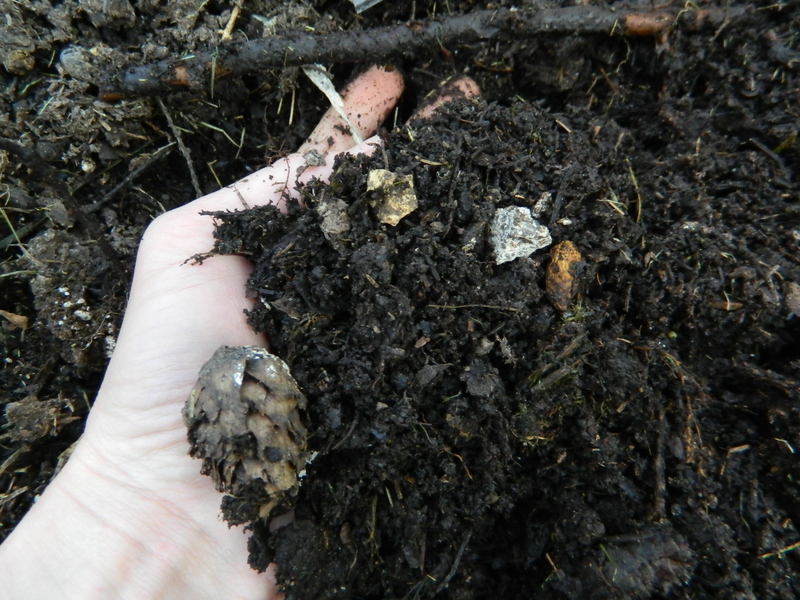 create a frozen palette in our compost bin. Shalain calls to tell me her 44-year old friend is gone. out of her home where she died. and pulls out a tangle of last year’s tomatoe vines. I dump in dry leaves, then stop to moisten each layer. A season’s worth of waste begins to heat. plunging my hand into the rank darkness. 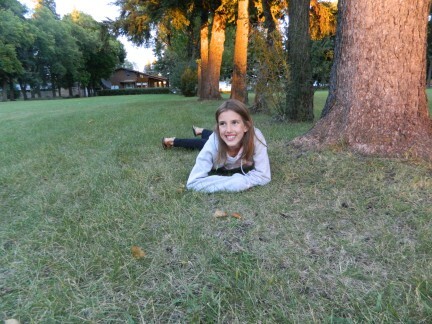 and I squeal at the same old miracle. Billions of microbes pulse with new life. Sandy’s funeral was last week. She was too young, too vibrant to go. with her arms raised triumphantly. a body in the casket like that. I wheelbarrow the fresh compost to its new home. I would carry it teaspoon by teaspoon if I had to. not a single crumble slips off my spade. Everything discarded has become precious. Bacteria sings the chorus of resurrection. Not even in a pile of garbage. 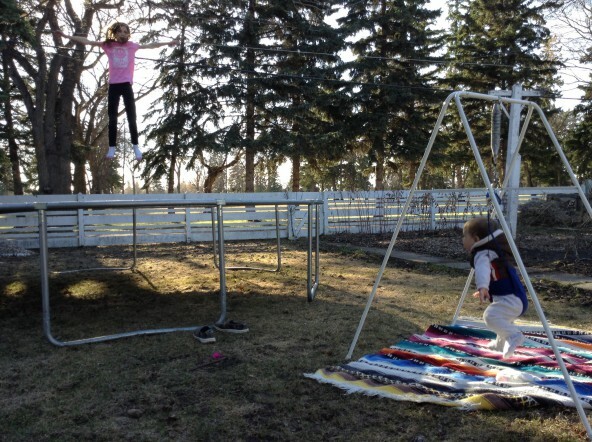 Golden leaves litter the grass; wind whips at pony tails; nerves wait for the gun; calf muscles tighten; hundreds of shoes pound the ground; parents whoop, holler and even jump over fences–in suit pants and dress shoes–to keep up with their children and cheer them on. Yep, it’s cross-country season. I’m always mystified why it’s such a big deal here (three different meets for young elementary students) but I’m not complaining. Running is more accessible than many other sports; you don’t need special equipment or hand-eye coordination, only a pair of legs that work and a bit of spirit. In honour of the season I’m handing out ribbons, in the shape of sentences, to the ideas racing around my brain. They aren’t necessarily my favourite things in the whole world, rather, the top ten things I feel like noting today. One moment, during Belén’s birthday party, I’m having a serious and meaningful conversation with the girls, the next moment they’re all off playing tag. Salsa verde… Made from tomatillos, this green sauce for enchiladas fits my favourite cooking category: the one where you don’t need a recipe. 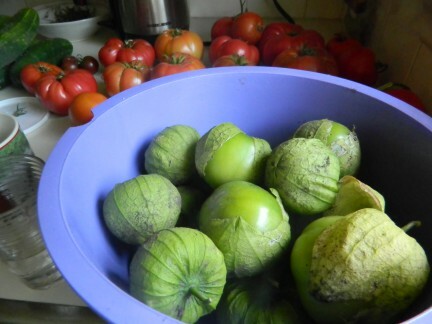 Of course, there are plenty on-line to follow but as long as you have tomatillos, peppers, onion, garlic and salt, it will turn out fine. I don’t add any extra water, but let it all simmer slowly before liquefying with my immersion blender. I’ve never cooked with tomatillos before growing them this summer but will definitely plant them again next year. Neighbours with garbage… Thank you Rebecca for sharing your wealth. The rotting broccoli, over-ripe tomatoes and wilted lettuce is much appreciated. When I see you coming up the walk with a full bucket I get excited just thinking about the nitrogen, carbon and microbes that will work together to make the most precious of gifts. Dirt. Now that’s neighbourliness. 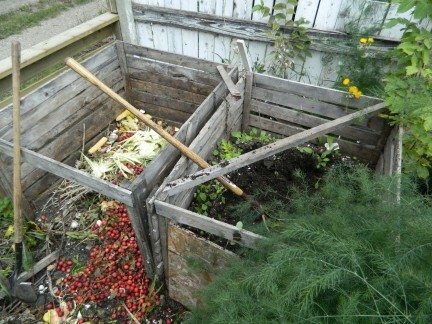 I have 2 compost bins; one for collecting and one for curing. (It takes about 2 months once I start turning/watering/tending it.) The one on the right is finished and I am shoveling it out here. 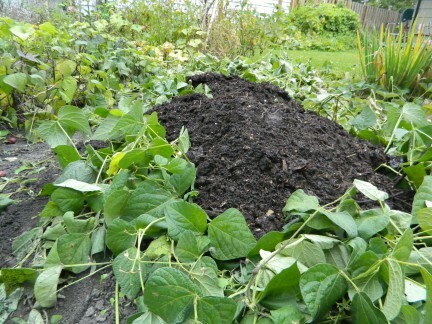 Instead of pulling my bean plants I piled fresh compost right on top (and spread it out later). 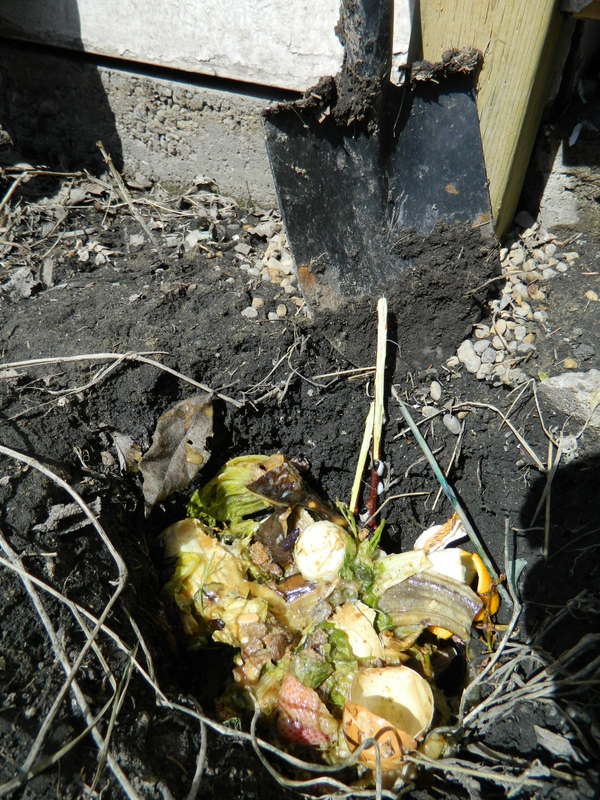 The nitrogen-rich plants should decompose in place and be ready to host tomatoes next spring. Wild goose meat… “You’ll need your knives for this kids,” Stan announces as he brings the grilled meat to the table. “Just pretend it’s jerky and you’ll be okay.” It’s true, the leg meat is chewy and tough but the breasts are different. Juicy and barely pink on the inside, they resemble steak and taste just as good. “It’s the rib-eye of the sky,” he tells us. We all agree, chiming in with compliments for the hunter. Watermelon packages… I tell her it won’t grow; she doesn’t listen. I tell her it’s too late, too shady; she plants it anyway. 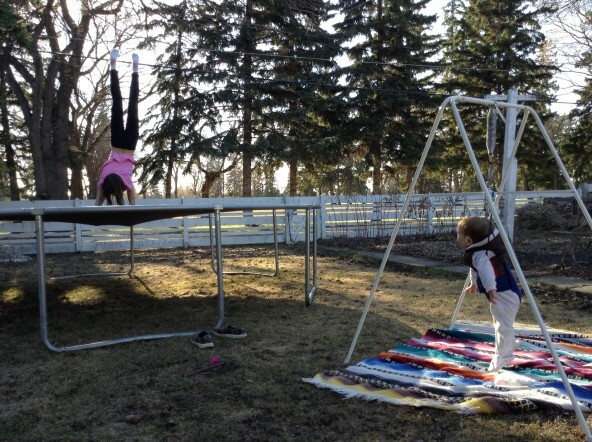 I tell her the vine is too spindly; she calls her grandma to tell her there’s a blossom. I tell her the fruit will never ripen; she takes every visitor back to the garden to see it. If watermelon could grow on faith and loyalty alone, this one would be a prize winner. 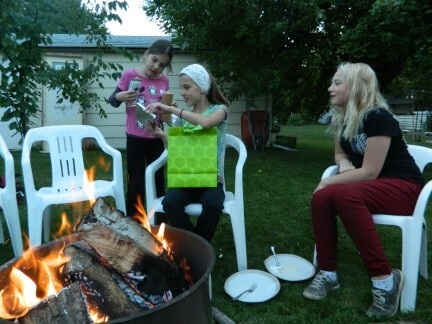 When her cousins from Ontario come she gives them the tour and leaves the best ’til last. Her dear watermelon, no bigger than a tennis ball and mostly white with a greenish hue, elicits sufficient praise. Matteus even asks for a taste. 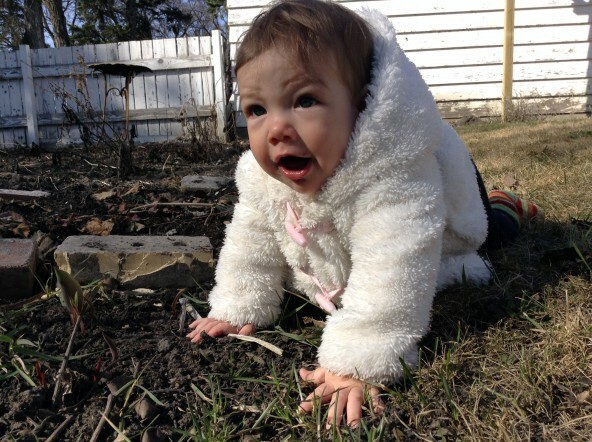 A week later we scramble to bring in the garden before the first frost and Susanna picks her precious fruit. She slices it up and gently places one half on a square of plastic wrap while informing her father she is sending it in the mail to her cousin. He shoots her idea down; she hums and keeps working. The next day I ask about the piece of rind wrapped up on the counter. “It’s going in the mail,” she responds. Susanna looks at me, smiles sweetly, and continues on. It’s still there, awaiting its final destiny: compost or Canada post. Who will win? This book… If you share my reading taste you will love Tattoos on the Heart written by a Jesuit priest who lives in gang territory in L.A.
And this one: Good God, Lousy World, and Me. It’s another spiritual memoir written by a human rights activist who comes to understand God is present even in in the filthiest, darkest, and most violent of places. 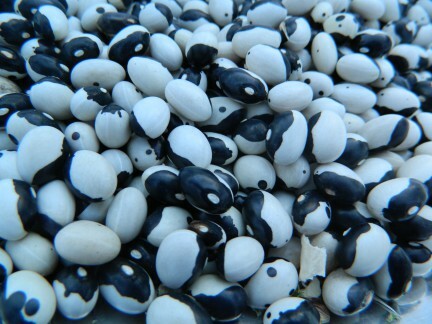 Orca beans… Dry beans are the middle child of the garden; they get on quite well with almost no attention. I planted a tiny corner of my garden with these and basically forgot about them until today, when I harvested enough for a few meals and next year’s seed cache. 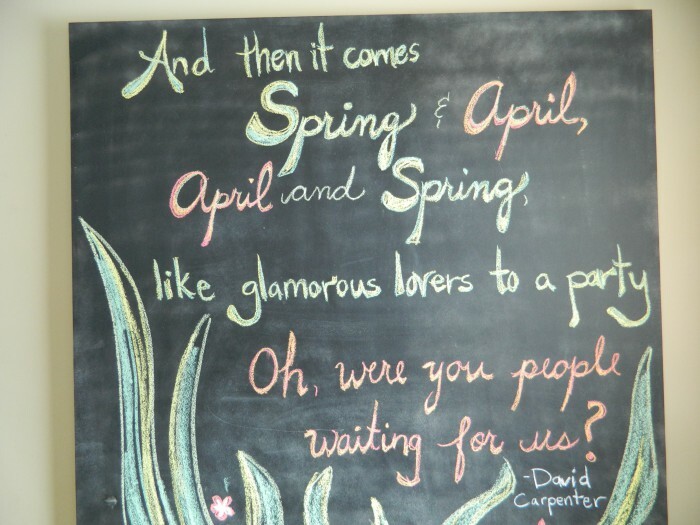 I believe Spring and April have crossed the threshold and it’s time to start the party. The winter clothes are stashed (though we always keep toques out, just in case) and the geese are coming home. 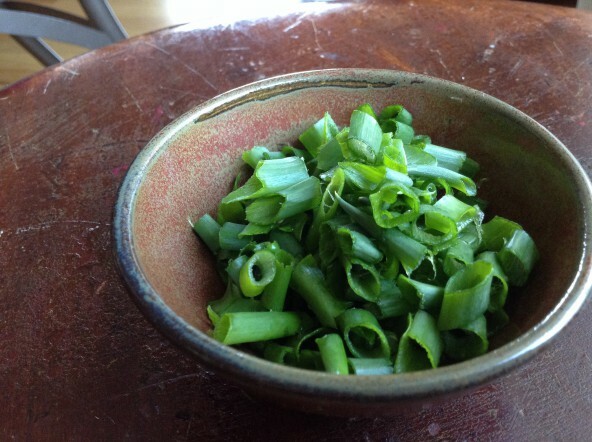 We’ve eaten our first offering from the garden–green onions, and there are weeds to dig. A sunny seven-thirty means baseball and bike-rides instead of pajamas and feather duvets. Yep, it’s finally here. Well, almost. The trees aren’t green yet, but we’re betting it’s going to happen this weekend. Literally. The gamble between us and nature is on; each of us have picked a day we think the birch tree in our front yard will leaf out. The winner will choose from a list of prizes we all contributed to (a brand new beach towel, $10 shopping spree, choice of meat on the barbeque, or ice cream). When I suggested the idea to my girls, Belén’s first response was, “Can I google it?” And the answer that, of course, was no. Two weeks ago, not a single website or search engine held the secret of spring. Even with technology, it’s still unpredictable and out of our control. All we can do is sit back and watch the miracle happen. Or bet on it. 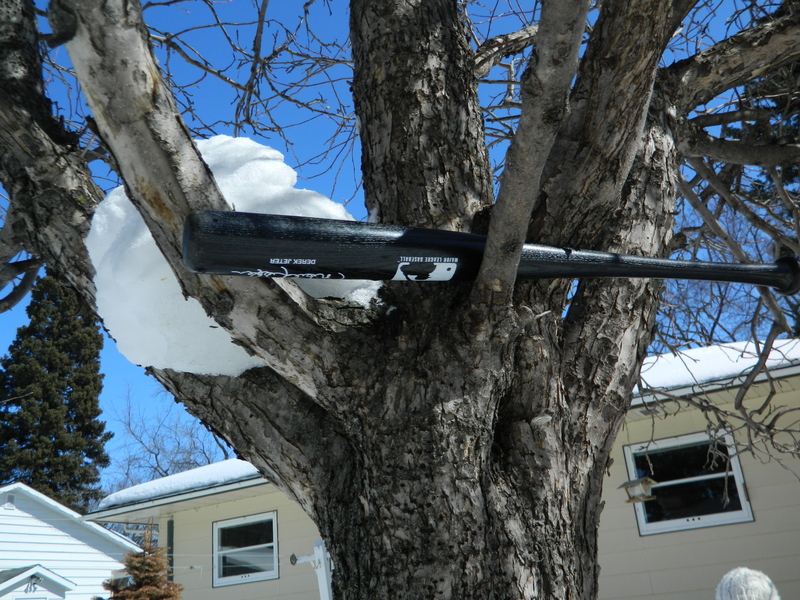 Besides betting, we’re also into bat houses. 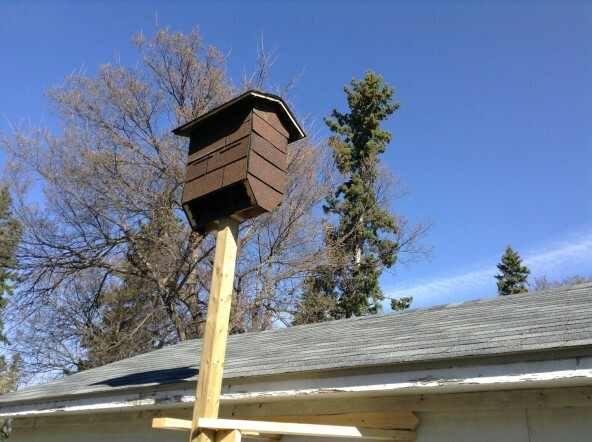 Stan and Susanna fashioned this cozy home in hopes of attracting hundreds of nesting bats to our yard this summer. We’re courting them because of their appetite for mosquitoes, but if I get some bat poop out of the deal (for my compost) I’ll be even happier. We don’t know much about these flying mammals so the whole process feels a bit mysterious. Does build it and they will come apply to bats? Happy Spring to you all! You made it through another winter. That’s something worth jumping up and down for! 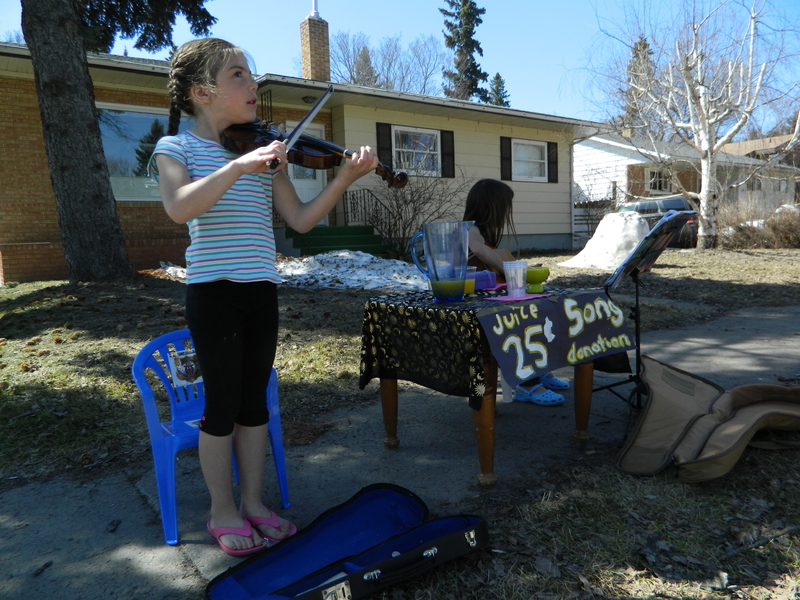 I am coming out to take a picture of their busk-stop, and I realize each are plowing through a different tune. I think they eventually worked out a system. They must have, because they made twenty-two dollars by the end of the afternoon. In other news, my compost is ready! The disgusting corner in the back of my yard paid it’s dues this weekend. 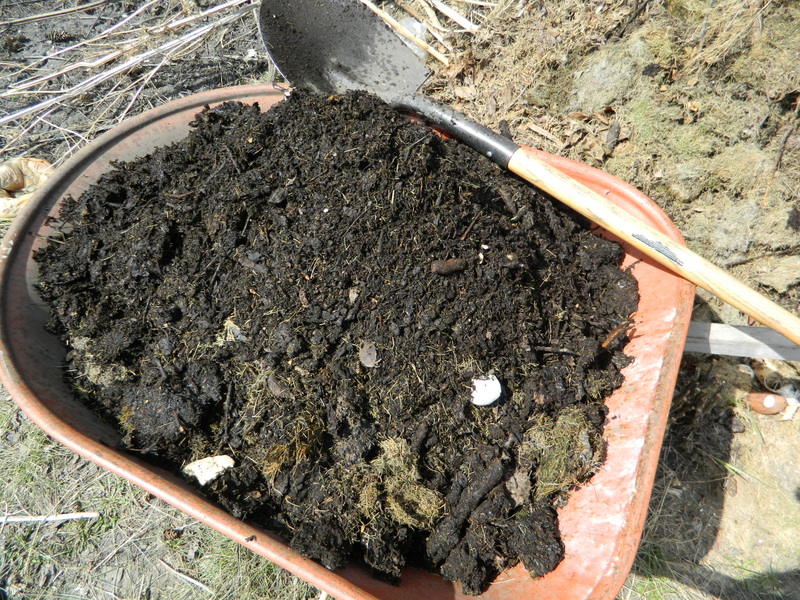 Finished compost–well mostly finsihed…I don’t get too uptight about the odd stick, egg shell, or even piece of fabric, that makes it through. Of all the confounding things I encountered that first year, the heat of decomposition–its intensity and duration–was the most surprising, the one that made me want to slap my knee and say, Who knew? That heat comes from the action of hordes of organisms, some so tiny billions can live in a tablespoon of soil. They are in there, eating and multiplying and dying, feeding on and releasing the energy that larger organisms–the plants and the animals–stored up in their time, energy that came, originally, from the sun. I think it’s worth it, for wonder’s sake, to stick your hand in a compost pile in the winter and be burned by a series of suns that last set the summer before. I love that last line. Maybe I’ve even quoted it here before, but it’s worth reading again. Do any of you have parts of your garden that seem hopeless? Hard, clay soil that forms giant lizard scales and produces only spindly thistles? I do. Last summer I gave the worst bed in my garden a rest: I planted it thick with hairy vetch, let the vetch grow until flowering stage, then hacked it down. 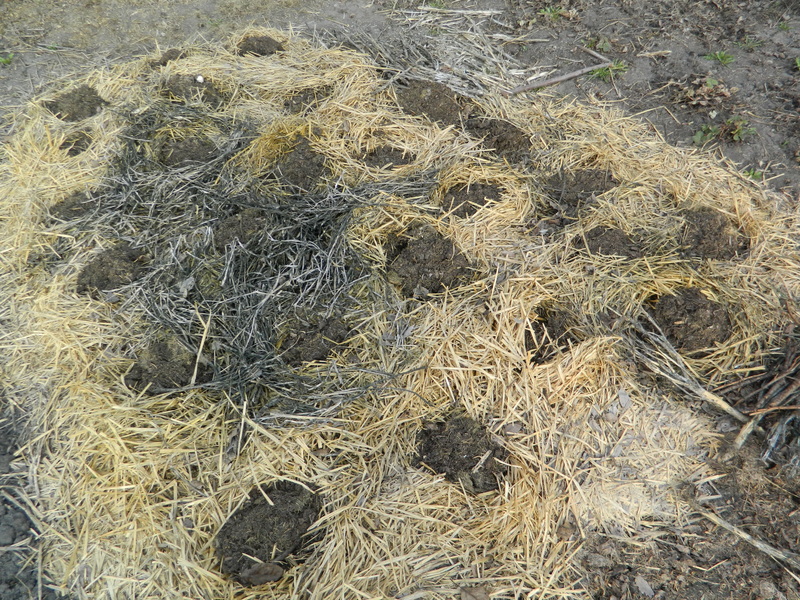 After, I covered the whole bed–chopped vetch and all–with wet newspapers, grass clippings and a bale of straw. 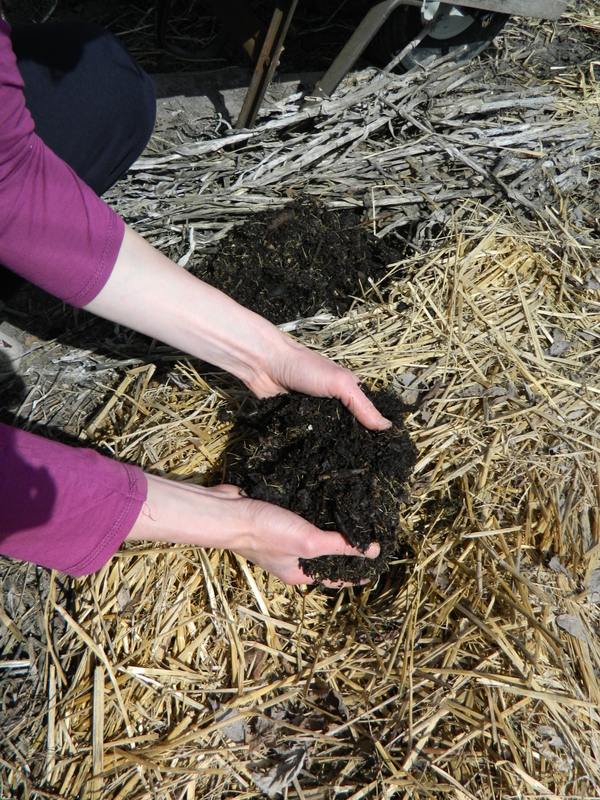 This weekend I dug deep holes in the straw and filled them with fresh compost. I plan to transplant broccoli into the compost nests this week. Here’s hoping that dead hairy vetch, decomposed root systems, heavy mulch and handfuls of compost work magic. Me, dealing with the straw. Compost bins in the background–they look less ridiculous without all the snow don’t they? 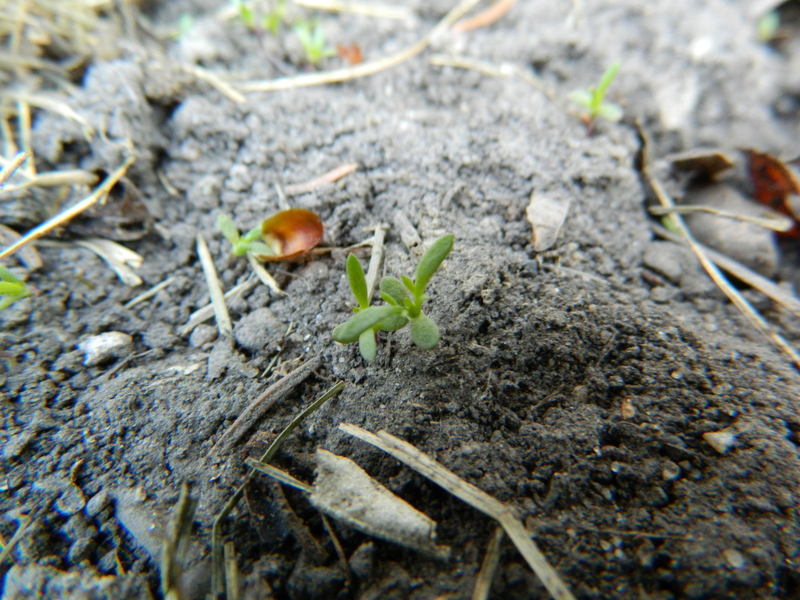 Waiting for the broccoli plants… I will update on those later in summer. I promise. Even if the cabbage moths are horrific. 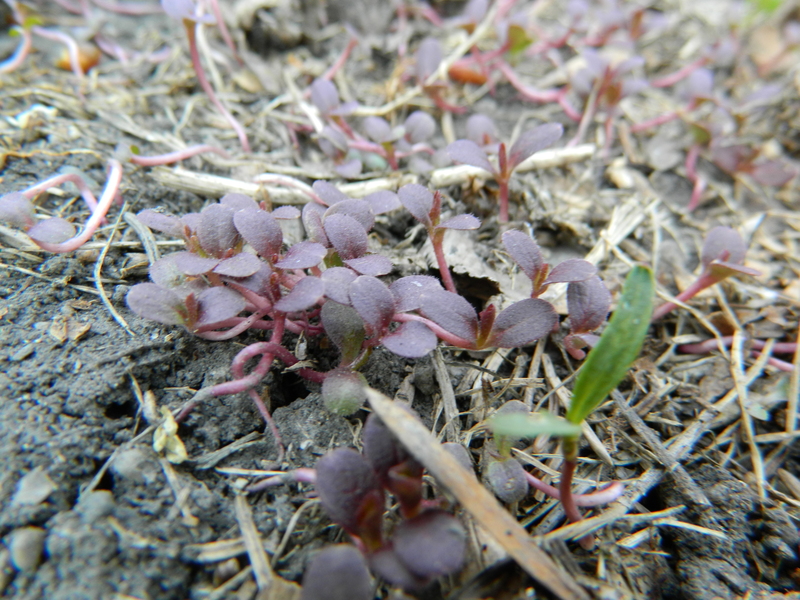 And finally, a few pictures updating our fall seeding experiment. Belén’s red lettuce (and one parsnip in the foreground) seeded in October. 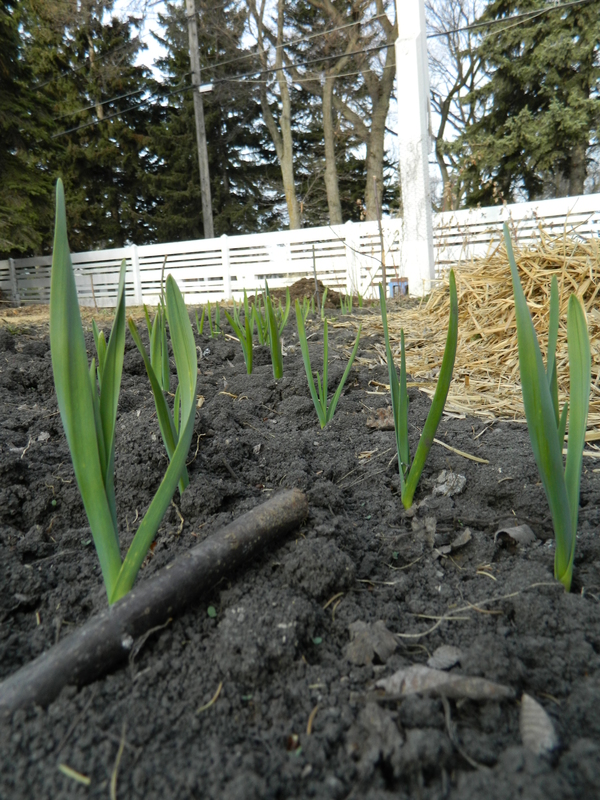 What are you all trying in your plots, or pots, this spring? *Pues. One of those handy Spanish words that should be adopted into the English language. It doesn’t really have a direct translation, but it’s something like “of course” or “well then”. I heard Belén use it, correctly, once and realized she probably thinks it is English. 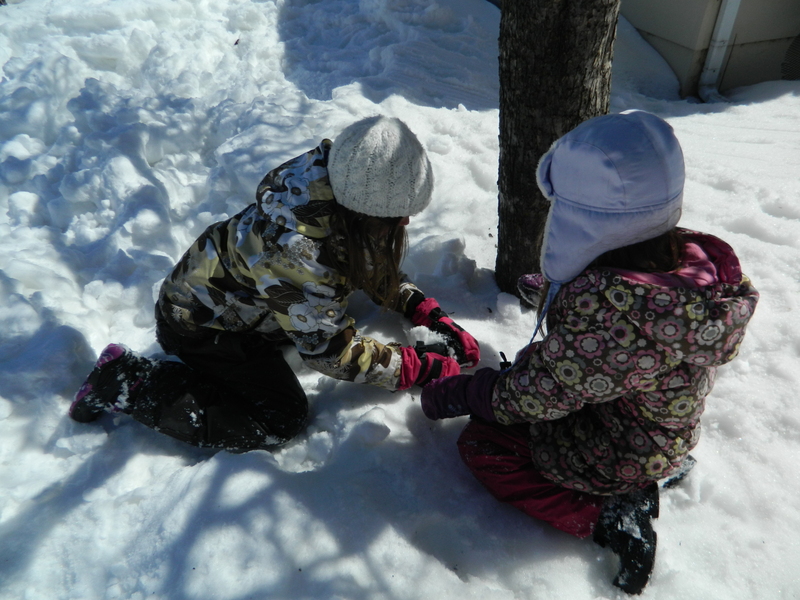 We sat around and watched the snow melt. Literally. 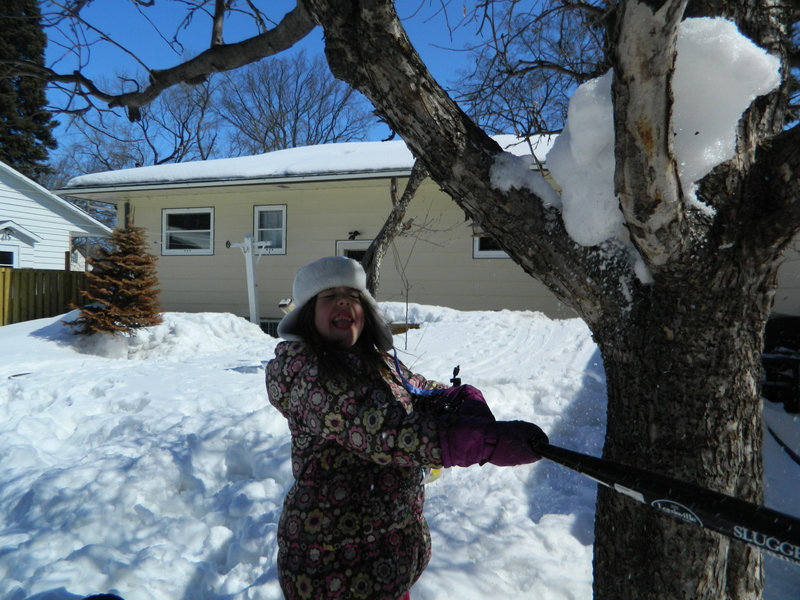 At 12:30pm, Sunday afternoon, we put a stick at the edge of the glacier in our yard. About every half hour we’d look and see a few more blades of grass appearing where the snow had been. We took breaks from our watch, of course. I planted snap peas in a bit of bare soil by the fence; Susanna and Belén agreed the sun wasn’t producing results fast enough and decided we needed to see our sidewalk again. 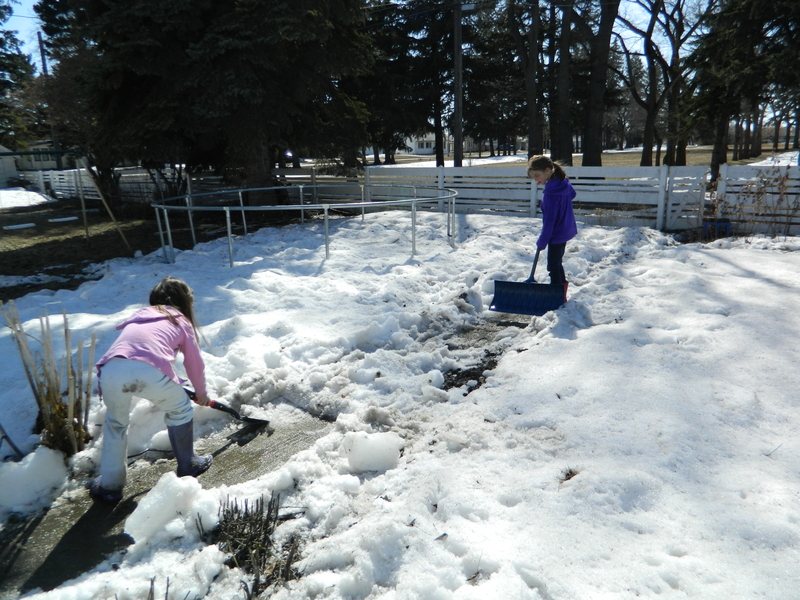 You can see where we set the lawn chairs up to watch the snow melt (and envision a garden). 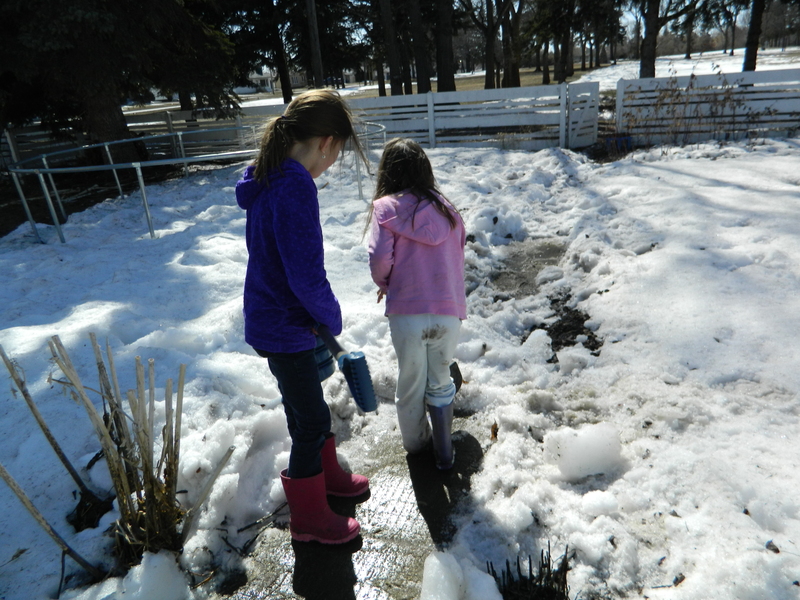 After the girls cleared most of our walk we took turns sauntering down its length–feeling awfully civilized to be treading on cement (instead of wallowing in snow). We marked the spot where we buried these scraps (in one of our garden beds) and plan to check periodically to see how fast they decompose. Remember how Belén looked in 9 different stores to find just the right diary? Well, something happened along the way; she lost all her money. 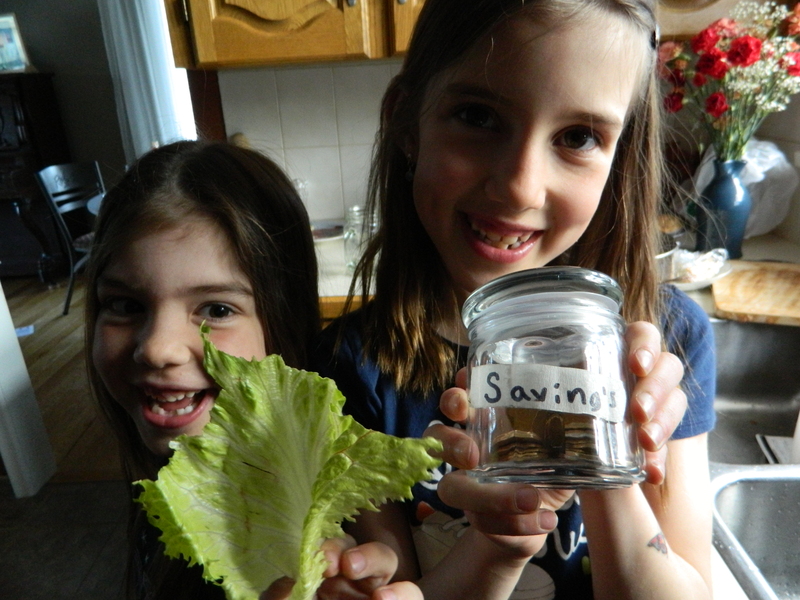 She was carrying around her entire life savings (22 loonies and 2 toonies) in a jar because her wallet wasn’t large enough to hold all the coins. By the time we finally found the journal, several days after the first shop we visited, she realized she had lost the money to pay for it. After I made her go check our vehicle again–you could lose a small child in there and not know the difference–she asked about what would happen if we never found it. Who would pay the losses? Would she have to save up her allowance for months to recuperate the 26 dollars, or would mom and dad kick in with some insurance? I held off on my answer, partly because I wasn’t sure what to do. As a kid, I was perpetually losing things (and still am) so I have compassion for such deliquency; on the other hand I was sure that more consistent, wiser, stronger, disciplined parents would take this opportunity to teach a hard lesson and forge real character in their obedient and wonderful children. Then, several days later, she said the last time she remembered holding it she was in Walmart. “Oh-oh, that’s not good. I don’t think a little jar with shiny coins will last long there, but I’ll try calling just in case.” And so, I apologetically explained to the customer service associate that I was looking for some money. Twenty-two loonies and two toonies, to be exact. We don’t need the evening news to hear about people who are mean and nasty. Aren’t we all mean and nasty at some point? I am. Mostly with my darling children. But isn’t it nice to think about what went through the person’s mind who picked up Belén’s cash? Oddly enough, we never went close to the electronic section the day we were in Walmart. Perhaps someone planned on stealing it but their conscious kicked in by the time they got to the electronics section. More likely, the truth is less dramatic. Whatever the story, all of us were happy with the ending. At home, with the savings jar safe and sound. I guess Susanna thought she needed something to show too. PS. By 5:30pm there was a foot-and-a-half gap between the stick and snow, in case you were curious. Belén, and accomplices, attacking the head of our giant hen. 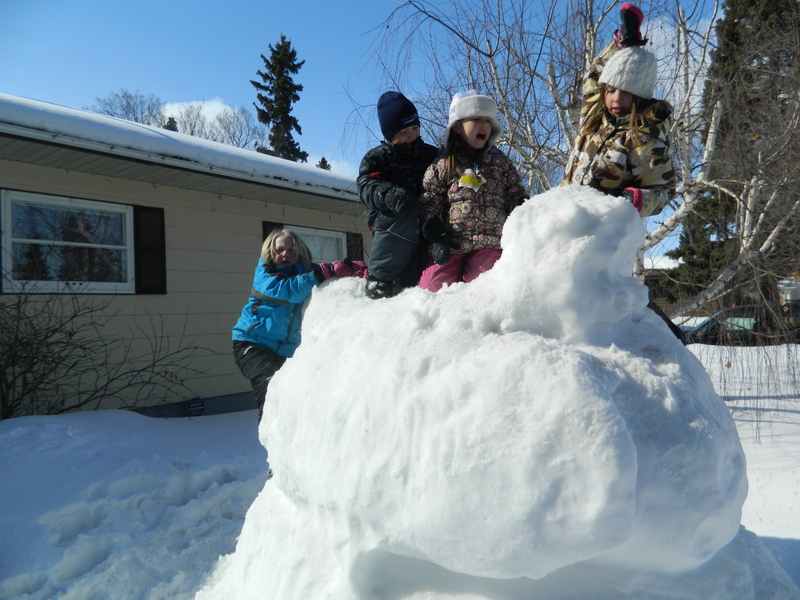 The snow sculpture has lost its novel appeal. In other news, we’ve been talking birthing plans around here. Rather, Belen’s been talking birth plans, trying to hammer out the details, oh, about 20 years ahead of time. Susanna pipes up at this point, concerned she’s being left out of the picture. “You’ll be at my head,” she says decisively. I ask where the father of the baby will be; she looks puzzled for a moment and then says, “Oh, he can just go down by my feet, I guess.” It sounds like he’s as much as an afterthought as a piece of limp parsley thrown on a plate at a cheap diner. “And my husband, where will he be? I might have a husband, you know.” All of a sudden this is getting very complicated. “At my feet. They’ll both have to be down there.” Then Belén sits back, looking pleased. 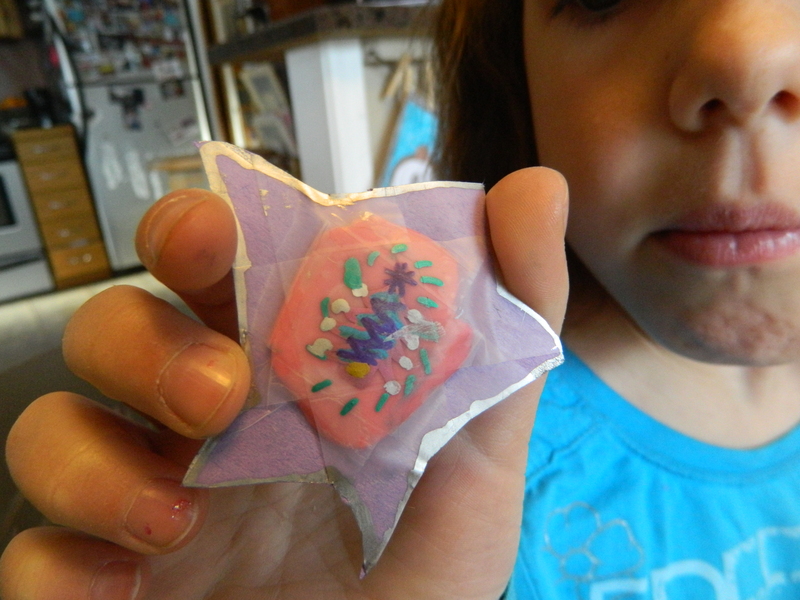 Susanna carefully constructed this decoration: a framed piece of chewed gum with embellishments. Where shall we hang it? Come on, use your imagination. Can’t you see the Mariachi in the background? 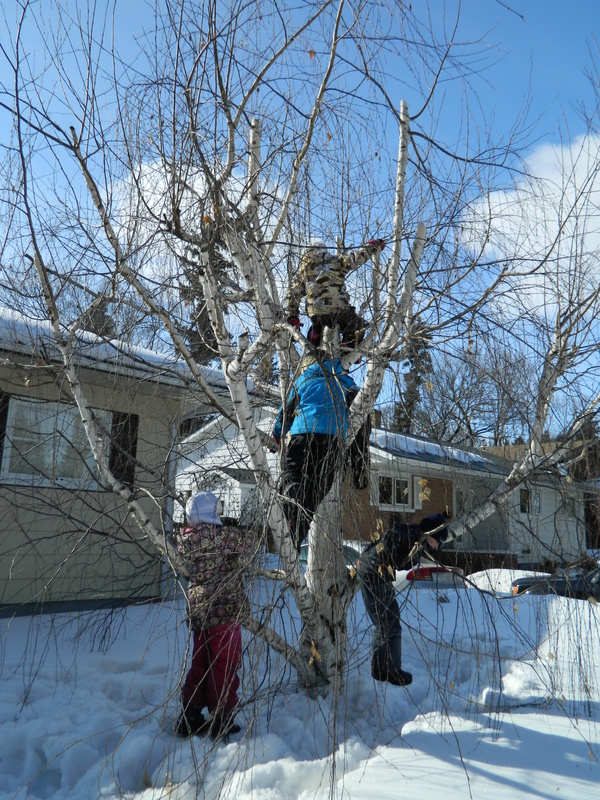 Once the snow piñata crashed to the ground, Belén and Susanna started scrambling for candies. And then they started fight. Yes, indeed. They managed to fight over candies that didn’t even exist! A mad scramble for the “candy”. 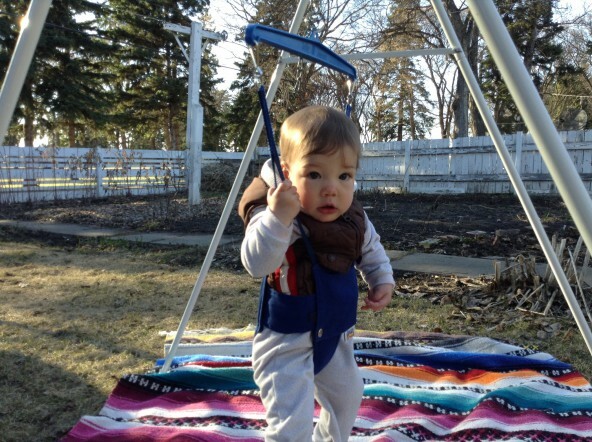 Here’s my parting shot; your response indicates your perspective on life. Are you the the kind of person who sees rich, dark humus and visions of juicy tomatoes, or does this make you want to call the city bylaw officer? 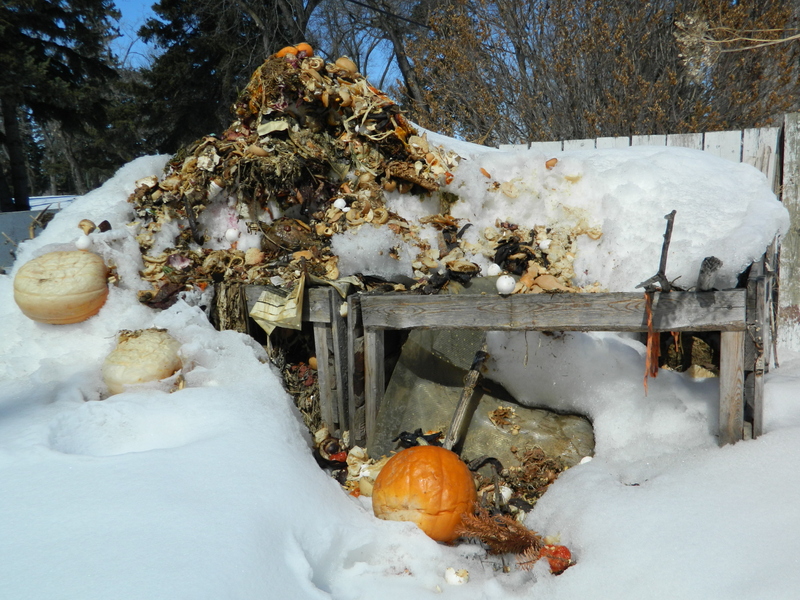 I’ve been adding to my compost pile all winter and the snow has fallen just as fast, making it into a towering white mountain. 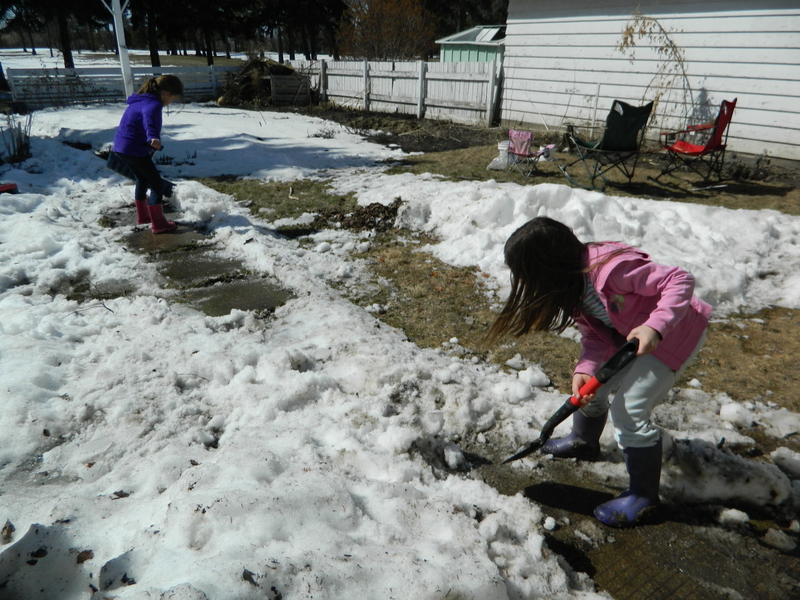 As soon as all the snow melts, I’ll mix in last year’s leaves and some fresh grass clippings to get rid of the evidence. 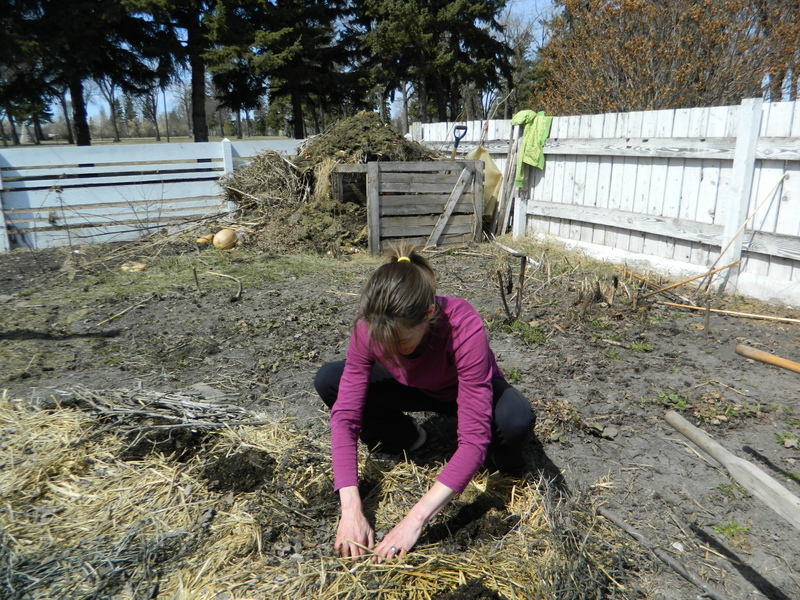 Yours truly, waiting for a steamy compost pile to dig around in!